Despite Israeli Pressure, European Aid Ship Plans to Arrive Gaza on Oct 20th! Rights activists said that If Israel commits another terrible crime, then we cannot stop them. 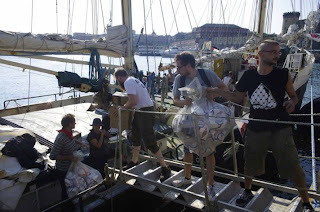 Sweden’s third aid ship ‘Estelle’ and 20 peace supporters on board have been on their way to Gaza since June 20. Media coordinator of the Ship to Gaza Estella campaign, Mikael Lofgren informed Anadolu Agency about the ship and their initiative. Ship to Gaza “Estella” left for the city of Gaza from Umea, north of Sweden on June 20 with twenty people on board including several Israelis.